Synthetic peptide within Human Tau aa 700 to the C-terminus. The exact sequence is proprietary. WB: SH-SY5Y cell lysate. IHC-P: Human brain. Our Abpromise guarantee covers the use of ab32057 in the following tested applications. WB 1/5000. Predicted molecular weight: 79 kDa. 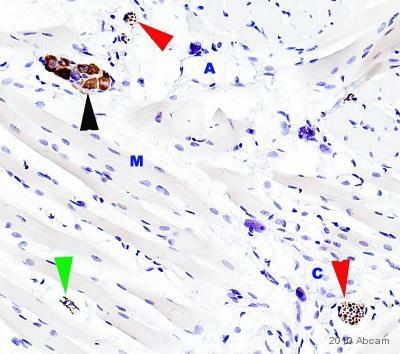 Ab32057, at a dilution of 1/500, staining Tau in paraffin embedded human brain sections by Immunohistochemistry. lysate SH SY5Y cell lysate treated with Oka/CalA. Cells are serum-starved overnight, and then treated with 1nM calyculin A and 500nM Okadaic acid for 2 hours at 37°C. Publishing research using ab32057? Please let us know so that we can cite the reference in this datasheet. Our customer conducted weastern blotting using ab64193, ab32057. He detected bands around25kDa not 52kDa(ab64193), 62kDa(ab32057) mentioned on datasheets. He tried to alter many steps such as primary antibody titer, incubation time and diluent bufferto optimize this antibody. But results were not changed. Please comments or advice about size difference. He almost used up his antibodies to optimizing conditions so, he would like to know if he can get samples. Thank you for contacting Abcam regarding these antibodies. I am sorry that your customer is experiencing difficulties with these antibodies in WB. Based on the protocol information and information we have about the protein, there does not seem to be a good explanation for why you are detecting a band at the incorrect molecular weigt, and importantly, at the same molecular weight. I noticed that the customer has not performed a no primary control. Is the customer sure that the secondary antibody is working well and not the cause of background? I would advise performing this important control and considering testing another secondary antibody as well. If the secondary antibody does not appear to be the cause of the problem, I am happy to offer a replacement or credit. Why is there such a discrepency of the KDa of the detected target in this instanced? Thank you for taking the time to call me yesterday. Ab30663 recognises the isoform of Tau around the 48KDa mark. My colleague has spoken with a friend who works in this field. It is well known within the field that blotting against the non phospho form of Tau will give multiple bands (ranging from 45-65 KDa) this represents multiple isoforms of the target. The dominant isoform (even the phospho forms) will vary depending upon the species and the stage of development (which is why the other Ab to the same target detects a different sized band). There is a good review on the dephosphorylation of Tau written by Hanger et al about ten years ago that would be of use to you in this field. I think the Pub Med ID is: 11447841; however if you search Hanger DP a whole list of suitable papers can be found. I hope that this helps. Should you have any further questions then please do not hesitate to get back in touch with me.